Why I will listen to this book again? Because the writer (in fact the narrator) explains so clearly how these dogs are trained from the earliest stage of their life, and how they evolves in a special operation, that you are sent directly with them and the soldiers in another way of life, full of trust and loyalty. The selective process and the values defended by the author (for dogs and human) are very interesting too, better than a dumb self-improvement guide. 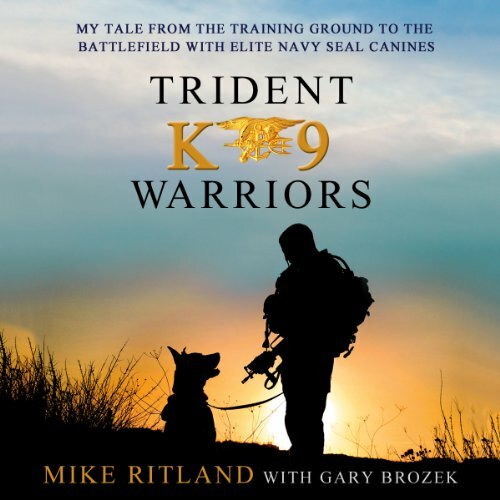 Avec quel autre livre pouvez-vous comparer Trident K9 Warriors ? Expliquez pourquoi. Do I think about another comparable book. No One, Unique. Quel caractère - joué par Jeff Gurner - était votre favori ? Which character is your favorite? It is not a Disney book, characters have no importance at all, only facts. In fact, I wanted to hear that book in only one time, but I fall a sleep at 5am. Other comments? Yes very good book, brought me more than I wanted. Wäre ein tolles und spannendes Hörbuch, wenn man ein Hundefan wäre. Sehr viele technische Einblicke in das Wesen Hund - und zwar alles vom unterschiedlichem Wesen der Tiere, der Rassen bis hin zu Ausbildungsanforderungen und -techniken etc. Wie gesagt, hört sich eigentlich sehr spannend an, habe aber etwas total anderes erwartet und bin etwas enttäuscht.